I've recently shared the story of my choice to go vegetarian (you can begin the series here). One of the influences I mentioned is the film Forks Over Knives . The son of one of the doctors in this film also follows the same diet the film discusses and has some shows and books based off what he named The Engine 2 Diet. Not vegetarian, not vegan, but a "Whole foods, plant-based diet." Their reasoning behind this is because they avoid not only meat and animal-based products, but oils and processed foods as well. Yikes! It sounds harder and harder to follow. My diet isn't nearly to their level yet; I go meatless but I still have some eggs and dairy (who doesn't love cheese?). As far as oil...I'm trying to cut down, but I'm not ready to eliminate. I do understand their reasoning, though: oil is fat, plain and simple, whether you have been told it's a healthy fat or not. That makes sense, and since there is always news about something being less healthy than once thought (case in point, olive oil), I figured it was time to find ways to at least cut back. Greek Yogurt: Well, any yogurt, really, but read your labels! A lot of sugar can be lurking. Go for plain yogurt. When substituting yogurt, use 3/4 of the measurement of oil called for (math, sorry...essentially if it calls for a cup of oil, you would substitute 3/4 cup yogurt). You can also be lazy like me and do an even swap. The results are pretty rich. I also found out that you can substitute yogurt for butter and other ingredients. The rules for each can be found here. Applesauce: This is what I do most often. I do an even swap (ok, so maybe that 1/3 cup is a heaping 1/3 cup, but the results are delicious!) Again, watch your labels. Go for organic if you can and plain. You want as little sugar and additives as possible (although cinnamon applesauce could be quite tasty in a spice cake...). Avocado: This one is new to me: In April's issue of Redbook, a shout out was given to the book Absolutely Avocados by chef Gaby Dalkin. The snippet is just enough tease that I know I will likely shell out the cash to buy the book if I can't find it in the library. The example given is that she substitutes one avocado for one stick of butter in her chocolate chip cookies. Seeing as how avocados and I have recently come to terms, I am super excited to try this soon! 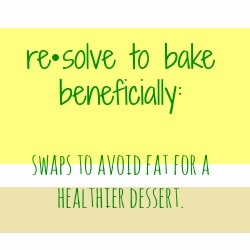 What is your trick to making your favorite baked goods healthier or friendly to your specific diet? Good ideas for swaps! I have never heard of the avocado one! Avocados are terrific as a sub for butter on braed, but I have never heard of them as a sub for butter in cakes. Interesting.I usually use Olive oil but will try that. I love meat, but have lost 17kg in the last 18 months by eating healthily. Well worth the effort to change eating habits Bekah....good for you. I like subbing honey for sugar and coconut oil for vegetable oils. I haven't tried avocados yet, but seeing as how much I love them, it's only a matter of time! I love to use applesauce, but I've not tried Greek yogurt or avocado. I'll have to give them a try! I have used both applesauce and yogurt as substitutes. My daughter is a vegetarian and I enjoy eating meatless at least 2 times a week. I have never thought of using avocado as a substitute! I look forward to reading your recipes! Thank you for linking up to the In and Out of the Kitchen link party! I am so glad you dropped by. I look forward to seeing what you bring next week! I am now following your blog and other social media! Also, did you know that in addition to using them to cut out fat, you can use yogurt or applesauce in place of eggs? 1/4 cup per egg! Yogurt is what I almmost always use, and I also usually add about 1/2 teaspoon or so more baking powder/soda (since eggs help make things rise). It works perfectly and gives you really moist baked goods! You can also use ener-g egg replacer or flax seed/chia seed! Great suggestions. Thank you! I love the avocado substitute. I haven't tried the oil substitutes yet but I am always on a lookout for recipes that use honey instead of sugar. I have lots of raw honey in my freezer. I might as well use it! These are great! I am anxious to try them!